Check Internet balance Airtel 2G/3G or data pack of Airtel. 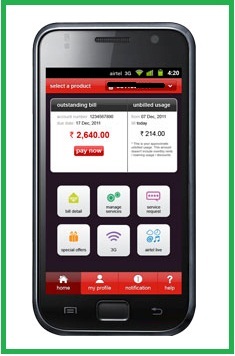 Airtel is an Indian telecom Multinational telecommunication and is ranked third all over the world. You can access your internet data pack information i.e balance and validity by either two ways i.e with MyAirtel mobile application or dialing USSD code. You can also check for their Customer care number for more information and APN of Airtel, if your internet is not working properly. To check internet balance, Go to home page of MyAirtel app, and tap on 3G label, where you will find the 3G usage Details. I recommend you to download this app. It facilitate to check internet balance and other balance. You can also check for last 5 Transactions by dialing 1217#. Share your experience of Airtel 3G/2G internet pack, by commenting below. 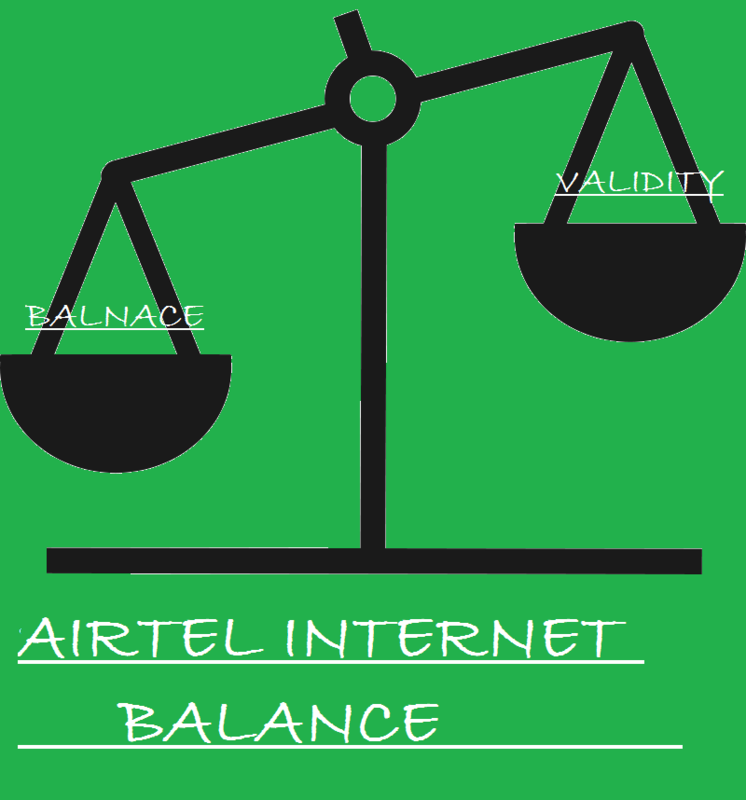 Hope you are able to find data balance after reading Check Internet balance Airtel 2G/3G or data pack of Airtel. If I dial *123*10#, after processing for sometime, it is showing that MMI complete. Please help me. I want to know my 2G balance. Works Great for postpaid 3G data usage check. Thanks!! thanks M. Karthick, this was very helpful. Thanks For Sharing This Information. 4 days before i have recharged my Airtel number with 200 MB which has validity period till july 1.
and my net pack become 30 MB after usage of 4days so i recharged it with 2 GB net pack what will be its validity period, is it work properly. i have both plane in 3g sim i have blance 2g and 3g but i want to use 3g first, how???? I have Airtel Postpaid Connection. I have activated My Plans. I want to check the usage of my data – internet/sms/call units. how can i check it???? I am using Aritel Prepaid SIM in data card and that is connected to wifi-usb router. How to check the 3G data balance of that data card without taking data card out and without calling Airtel Customer care? Pls how do I check my Airtel Free MB balance? *123*64# is very handy for checking 3g ni8 bal. Surprisingly,The customer care don’t know this codes. You need to dial *121# and then select option 4. You will get information about your whatsapp Balance. I charge 4.5 G but I can’t see it in my account how I can check it please ? *121*11# for 3G, *121*11# for 3G &, Just send a blank sms to 59103. Balance Transfer – *141# and Choose Options. My Air tel CUG No is now in Blackberry and I allready got the Micro cim with made a request for activation of 2GB internet package and the same has not activated since last one week. I want to check my 2g bal so m dialing *123*10# bt its nt working….how can i check ???? Just try again with *129*08# then press Ok ! Want to know . How to check Airtel Night 3G balance can anybody help I forgot . Thanks for Sharing Great Information . I had recharged with Rs.557 (Offer was- 4GB 3G/4G + 100 TT). However, the amount got deducted within 4 days and I could use only 2GB out of 4GB. Why didn’t I get the remaining 2 GB Balance. I am gonna PORT Airtel Service to DOCOMO. How to check 2G data validity in Airtel? Thanks for sharing Airtel USSD Code, thanks. How to check airtel night data balance..
Hi..my name is Tejas and I am using airtel 3g internet service but it is just showing 2g speed what should I do.. Dial *129*08# for complete information related to your account. I have recharched my data yesterday with 400 mb and when I dial *121# and select 4 option today it shows 2G internet balance Rs= 0. What to do? i joined newly to airtel. but feel uncomfortable because its cal rate too much high as comparison to other and its recharges are very costly. I dialed *123*11# to check internet balance for postpaid number and I am not able to find my net balance for Postpaid number. Port BSNL into Jio, Airtel, Idea, Vodafone, Aircel and other network.